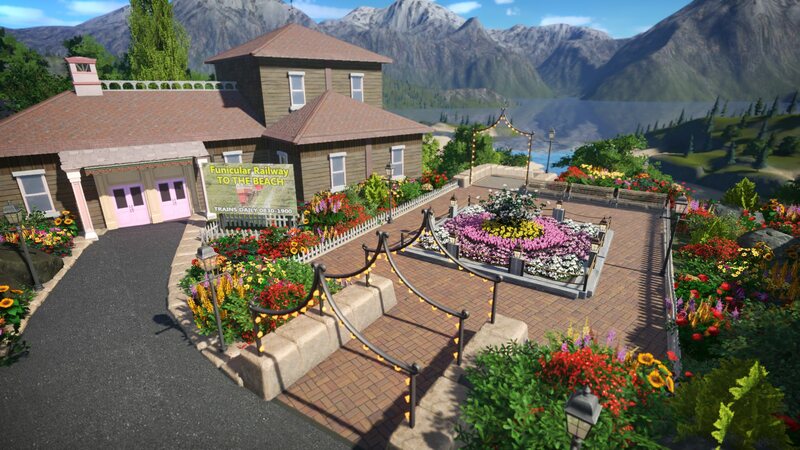 ﻿ SGW Summer Competition 2018 - Challenge #2 Winners Posted! SGW Summer Competition 2018 - Challenge #2 Winners Posted! How does one add letters / text? 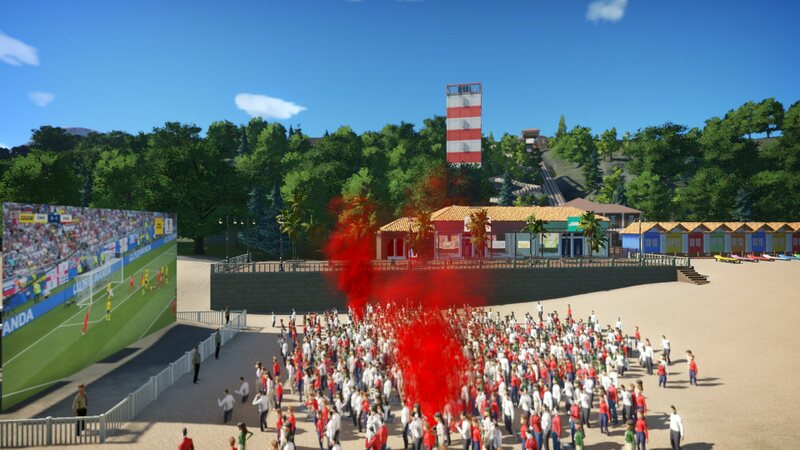 I came up with a name for my park, but i have no clue how to implement it. Anyone has suggestions for me? Most people make text with the art shapes in game, or other building pieces. A very slow, laborious process. Or - there are several full font sets on the Steam Worksop which you can download, but many of these produce very large letters. Just search "font" on the workshop and you'll find lots more. Many thanks for your reply PhDisney, much appreciated information. Ill try to find something to my liking. Else i will just mention the name of the park in the story that comes with it. I initially thought it would be hard to make my own signs, until I tried it. Then I tried it myself and found that, at least if you're making a plain, sans serif font, it's actually a trivial task. The art shapes are easy to manipulate and form these shapes naturally, you never have to make more than a few different letters, and most words will repeat several of those letters in the words of the sign. Even making a slightly more interesting font, say italic or with some serifs, isn't really any harder, again because you never have to make the full alphabet. The main issues are 1) the smallest art shapes are actually pretty big so any custom sign will be much larger than a regular sign, 2) the flat art shape arcs and circles are thinner than the rectangular and triangular shapes, so you have to fiddle with them to get the outer surfaces on the same plane, and 3) without going to a lot of trouble, your fonts will look just like everybody else's custom signs. Question, does this new entrance have to be at the parking lot? Or can this new "beach gate" be inside the park at all? No. 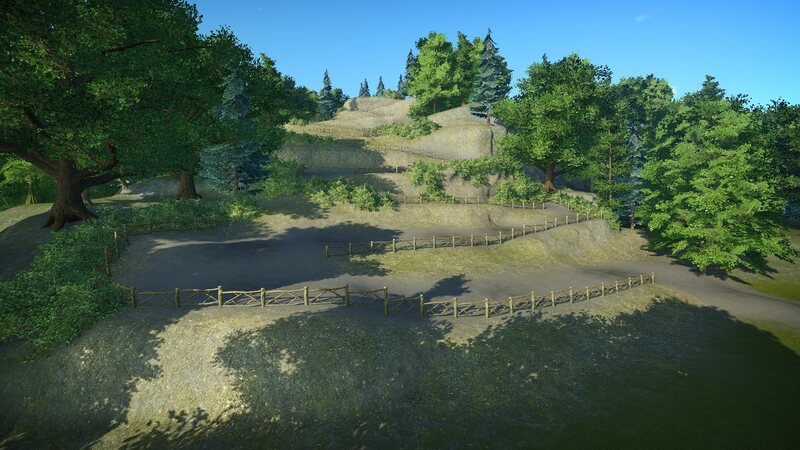 It's at the back of your park and can be at the top of the cliff or at the bottom, depending on how you want to do it. If you have a parking lot that extends to the top of the cliff, it could be attached. It all depends on your park configuration. This is not a complaint at all just talking about how I am finding the challenge. 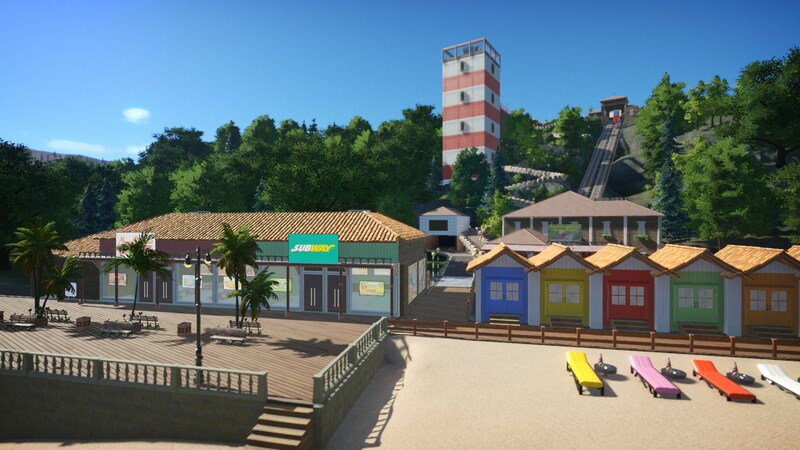 I dunno if it is because of how my initial layout was and that it is so compact but linking the parking lot to the beach is not coming naturally to this park AT all ha ha! 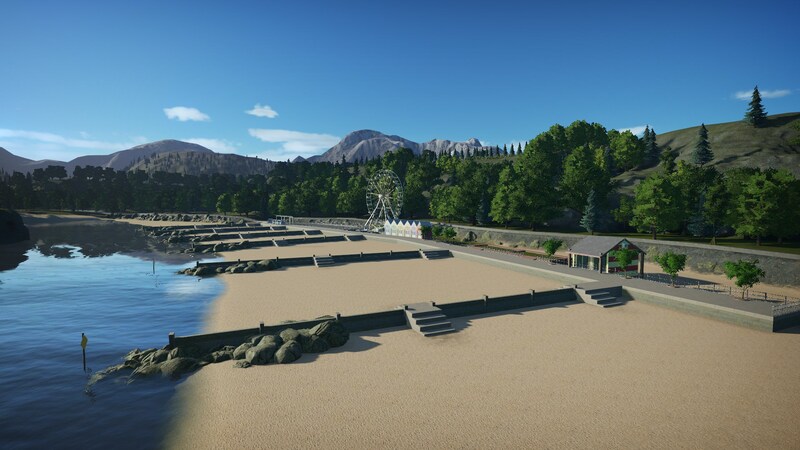 That being said I am happy with the effort I have put into the beach itself. I think I might totally fail the points of this challenge but still be like...aww it looks kinda nice. All of that response was about 10 smartnesses more than I could understand. something something the town council are being awkward? If you're struggling with creating a functional path down to the beach, you can opt for a non-funtional route. Such as wooden platforms and steps made out of scenery pieces. I think anything you add in addition to the challenge's goals can only be beneficial. I've been slightly panicking that everything I am doing is literally pointless hahaha! 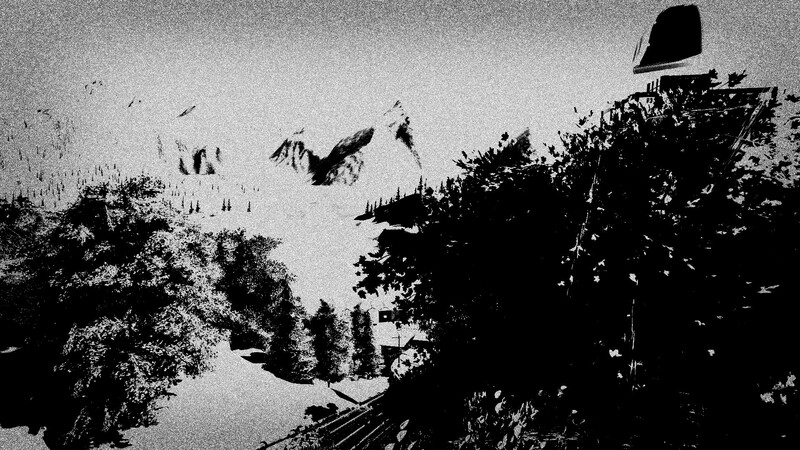 Some mischievous trespassers snuck into the park, but their night vision camera was on the wrong setting. Sadly - they didn't get a proper shot. Question. I had to catch up from the first challenge can I show some extra shots of that part of the park or can I only use the 6 mentioned. You can only post 6 screenshots. You will not be judged on anything from the 1st challenge, so your shots should only be of the Challenge #2 goals. If you can see parts of the 1st section in your shots, that's fine. 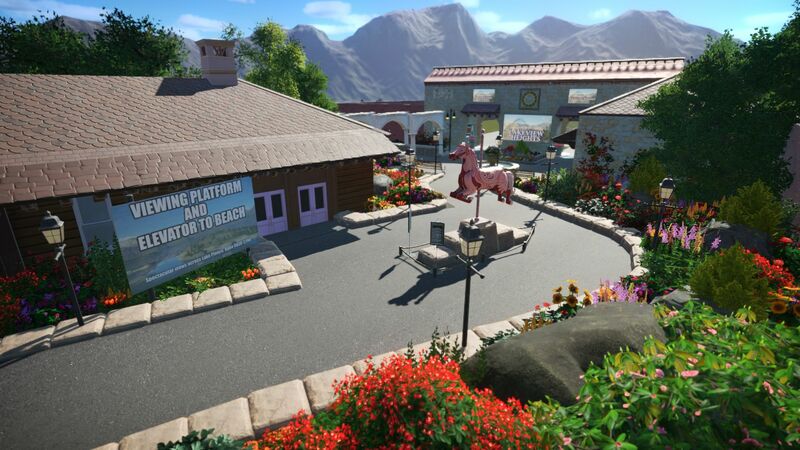 You'll also have a chance at the end of the competition to work more on your entire park and show it all off. 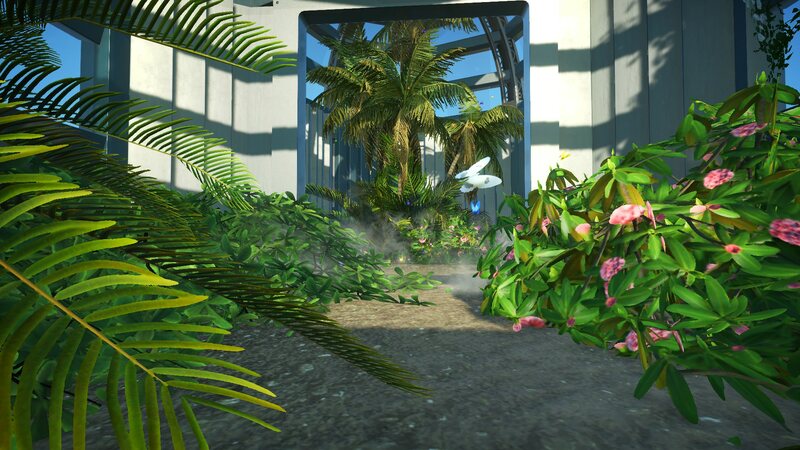 If we ever do a tracked ride, may we include a POV as extra or does it have to take the place of a screenshot? Well folks, here we go. I thought I'd be the first this time round. 48 hours early, but I feel I've done all I can for this challenge without adding things for the sake of it. Hope you enjoy my attempt at something unique and a little different. 1) Walk down a zig-zag scenic path, taking in wonderful views across the lake. The walk back up isn't as fun, though! 2) The Lakeview Heights Funicular Railway (LHFR), which really does put the "fun" in funicular! For a modest ticket price, guests can board at the cliff top, and emerge opposite the beach and boardwalk. 3) Perhaps the most innovative way of getting down to the beach, but the laziest, is in the lighthouse themed elevator, which buries down into the groundrock. At the bottom, guests emerge from a tunnel onto the beach. There is also a viewing platform atop the lighthouse to look over the lake, or back across the park. A worthwhile experience! (Edit: all three routes are fully functional! Alas, I don't have a working elevator or funicular railway, but the path enters the building at the top on both occasions, and then tunnels through the cliff to emerge through the station building door(s) at the bottom. Guests can use all three routes if they so wish). 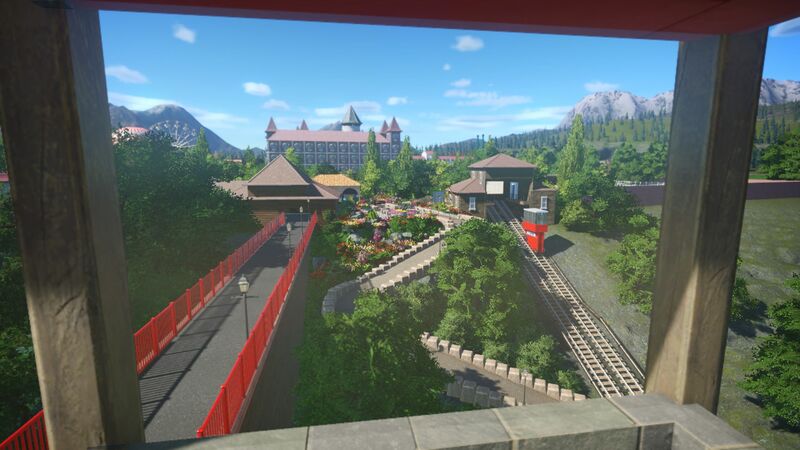 Here you can see the funicular railway station on the left, and the start of the zig-zag pathway beyond the scenic floral plaza. Taken from the lighthouse viewing platform, you can see the precarious path to the top of the elevator on the left, itself offering great views. The zig-zag path can be seen in the centre, and the funicular railway can be seen on its way to the beach on the right hand side. The beach has had a small development built since our last visit. Some bookable chalets can be seen on the right, with a small car park behind them which is accessed along the beach roadway. These each come with a lounger, which can be seen on the sand in front of them. Also found on the beach is a modest boardwalk, with two restaurants (Subway and Harry Ramsden's Fish and Chips), along with restroom facilities. Behind can be seen the funicular railway station, the entrance to the elevator, and the zig-zag pathway. The park itself hasn't been forgotten. Here is a simple, yet functional, second entrance, found near the entrance to the elevator on the cliff top. The path to the left, under the arches, takes visitors around the perimeter wall to the main car park, so that they can access the beach without entering the park. The ticket booths can be seen on the right hand side, under the canopies, and of course the main entrance can be seen in front. Of particular interest is the carousel horse on a pedestal. This, as the plaque in front of it explains, was an original horse from the original 1922 carousel at the old Lake Planco amusement park, long dismantled but never forgotten. It has been restored and sits proudly as a reminder of the past. Finally - we have one new ride. With a hot air balloon adorning it, and white mist effects, "Journey Through the Clouds" is a fun ride, just thrilling enough for thrillseekers to enjoy, but not too fast to turn families away. In the foreground is a park favourite - the giant checkers board! 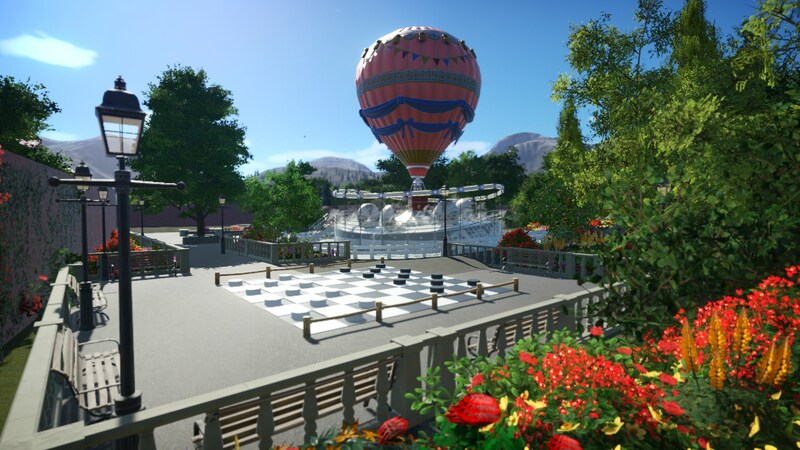 Guests can enjoy a game while taking a break from the rides. Well - that's your lot! Had so much fun with this challenge. Really looking forward to seeing what everyone else has done! Wow! That furnicular railway is amazing! That’s such a unique idea, and you got so much done this round! Nice job! WOW Ph, you totally just raised the bar for the rest of us. Thanks for giving us the extra 48 hours! Nice touch with the soccer crowd shot! JPAlmighT - I think you're flattering me a little too much. You guys in the top three last time were a country mile above the rest. I'm just a newbie having fun, building things I find interesting! Nowhere near you guys in terms of skill/ability/building styles etc. yet. That's not true and your entry proves that! You're a damn good builder and as you are a 'noobie' probably even better than that! 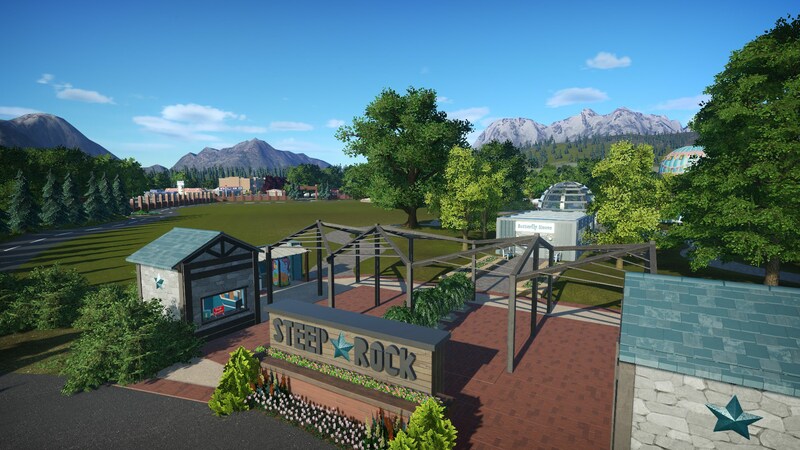 Here at Steep Rock we decided that it would be mutually beneficial if the beach at the foot of the cliffs were to be renovated and made more inviting to tourists and with that in mind we have contributed by partially funding a refurbishment of the beach. At the top of this QUITE arduous trek Steep Rock has built a second entrance to the park in order to accommodate the beach guests. You can also see our next attraction the butterfly house. It may look a little bit sparse around the edges here but we didn't want to alter anything until the next phase of building is finalised. 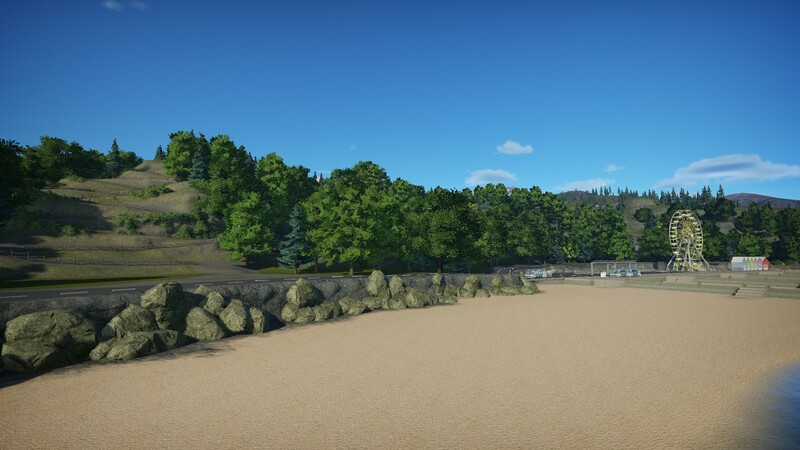 That being said if you look into the distance you can see that we have added a second entrance and a roadway inside the park. As part of the deal fixing up the beach we have convinced the local gov. to run a circular bus service with drop of points at the beach and both entrances to the park for those less...adventurous. 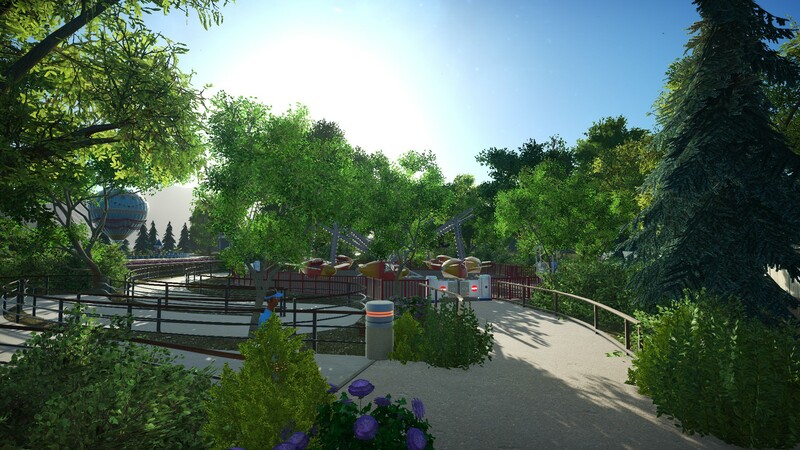 We HAVE done some more work to expand the park and have added a flying scooters to the main enterance of the park expanding it out towards the cliffs more.